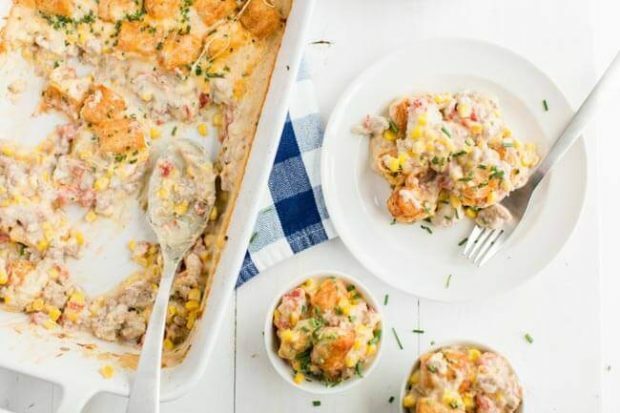 This easy and cheesy cowboy casserole recipe is the perfect dinner for busy nights. Our family loves this easy, delicious, homemade casserole recipe! This simple, hearty meal combines ground turkey, veggies, spices, crispy tater tots and lots of cheese. You could also make it with ground beef or ground chicken, too. It’s so quick to layer in a casserole dish and pop in the oven to bake. Even on the busiest nights, you can have an amazing homemade dinner from scratch on the table for your family. Like most mamas, I’m juggling an overflowing plate. I’m all about finding solutions that keep my family happy and healthy while preserving my sanity. That’s why I’m loving this cowboy tater tot casserole so much. It’s cheesy, filling and such an easy homemade meal! One area that I’m getting some extra help in is the kitchen. I love creating and serving my family wholesome meals — but sometimes I just don’t have enough hours in the day for all the prep necessary. 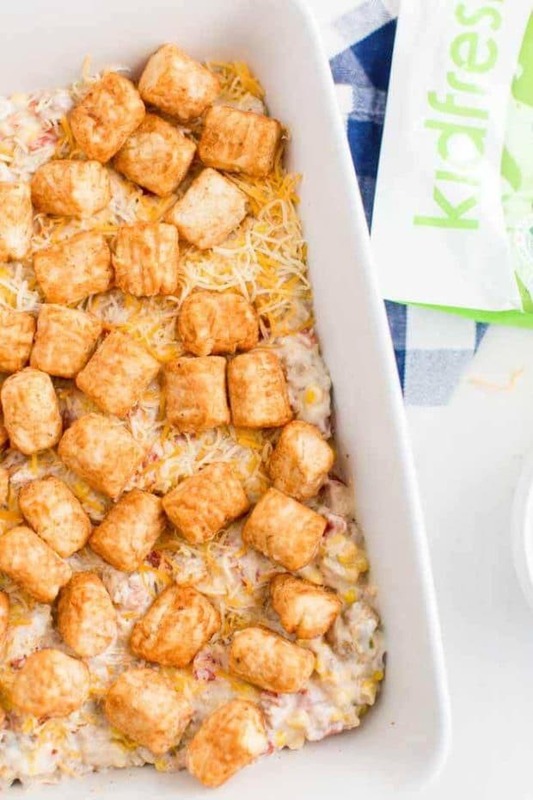 I’m proud to partner with Kidfresh Foods to bring you this delicious casserole! On those busy days, I’m utilizing extra support from my secret weapon: Kidfresh. Have you heard of Kidfresh? Their frozen foods boast some kid’s favorites but include hidden vegetables, they’re non-GMO and without artificial ingredients. 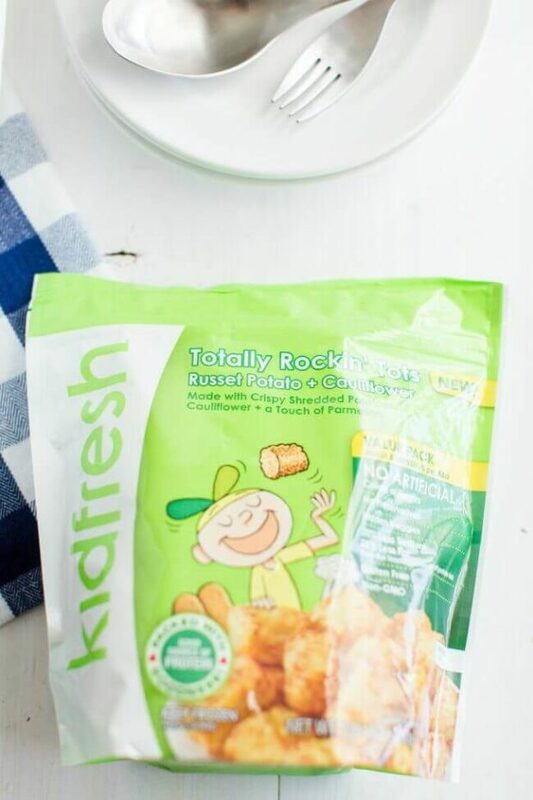 While Kidfresh products are great on their own, they can help kick any recipe up a notch. It’s been chilly lately, so we’ve all been in the mood for comfort food. Well, this recipe was a hit. I think Ryan ate almost this entire cowboy casserole himself. You can’t go wrong with hearty ingredients, crispy tots smothered in cheese! This cowboy bake will satisfy even the hungriest cowboys in your house. It’s a hearty dinner! From the spice rack, grab garlic powder, onion powder, ground black pepper and chives. 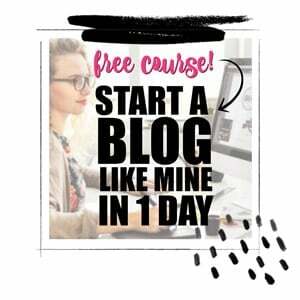 As you get started, you’ll want to preheat your oven to 375 degrees. Next, pour the tater tots in the bottom of a 9×13 baking dish. Place in the oven and cook for 8 minutes. Remove them from the oven and transfer to a bowl. Then, turn your oven up to 425 degrees. In a medium skillet, cook your onions until translucent. Then add the turkey. Cook for 5-6 minutes until it’s just done. Pour in the Rotel tomatoes and simmer until liquid has reduced. 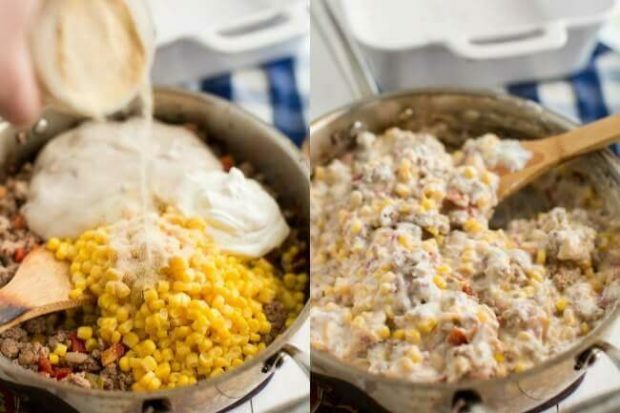 Remove from heat and add sour cream, cream of mushroom soup, drained corn and half of your cheese. Stir until the cheese is melted. Then pour the mixture in the bottom of the baking dish and then spread half the remaining shredded cheese on top. Layer the tater tots on top, pressing them down into the mixture. Sprinkle the remainder of the cheese on top, along with the chives. Cover and bake at 425 degrees for 20 minutes. Then uncover and bake for another 5-10 minutes. Can You Freeze Cowboy Casserole? Yes! Just be sure to store in a freezer safe, airtight container. Since this casserole is such a great all in one dinner, I usually keep the sides easy too. 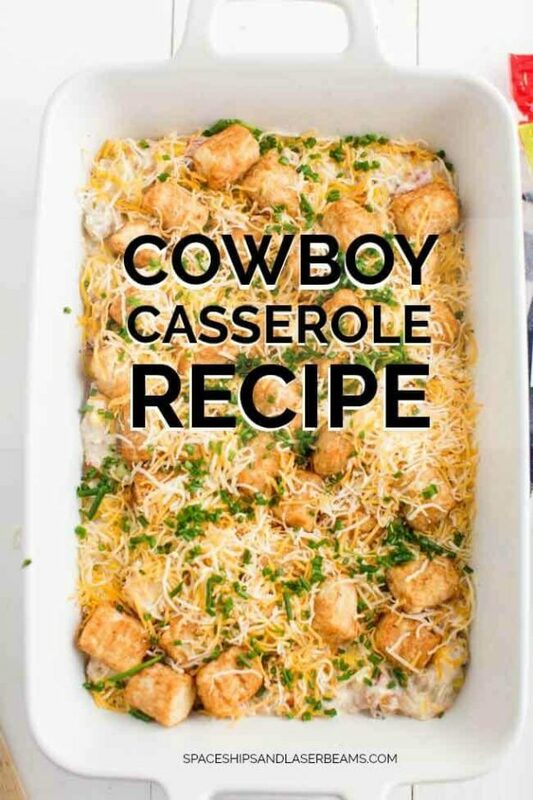 The recipe has potatoes and corn already so I usually make a nice side salad to go along with our cowboy casserole. Try this easy caesar salad recipe, it’s a favorite! If you want an easy dessert idea, pair this meal with our blueberry cobbler. The recipe is easy to put together, even on the busiest nights. I know your family will love this cowboy casserole as much as mine does! 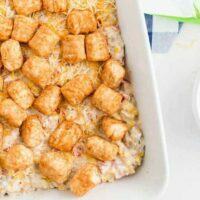 You’ll love this tater tot casserole recipe as well. Serve a caesar salad and dinner rolls or yummy beer bread on the side! This easy, cheesy recipe is the perfect dinner idea! Turn on your oven to 375°. 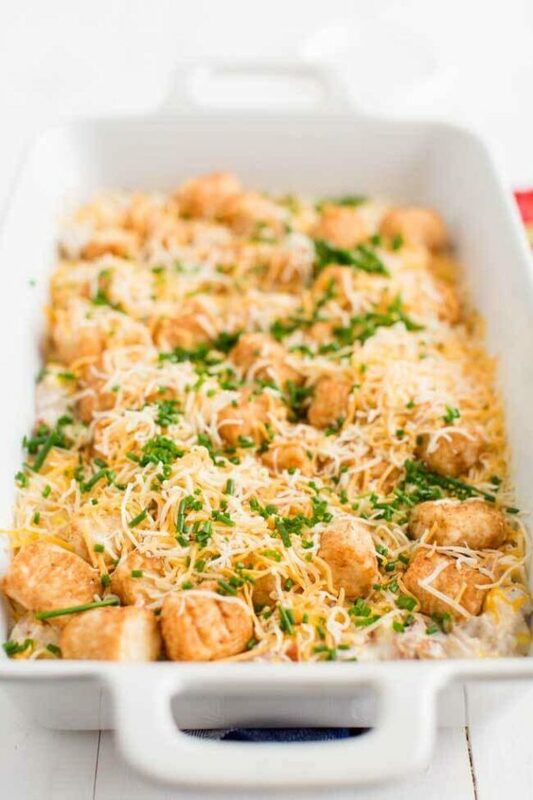 Pour the tater tots in the bottom of your 9×13 baking dish. Place in the oven and cook for 8 minutes. Remove from oven and transfer to a bowl. Turn the oven up to 425. In a medium skillet, cook your onions until translucent and add turkey. Cook for 5-6 minutes until turkey is just done. Pour in the rotel tomatoes and simmer until liquid has reduced. Remove from heat and add sour cream, cream of mushroom soup, drained corn, 1/2 of your cheese. Stir until cheese is melted. Pour the mixture in the bottom of you baking dish then spread ½ the reminder cheese on top. Layer the tater tots on top, pressing them down into the mixture. Sprinkle with the rest of the cheese and chives. Cover and bake at 425 for 20 minutes. Uncover and bake for another 5-10 minutes. This is so similar to something my my mom used to make all the time. So good!